The ultimate easy dip — served cold with corn chips, crackers, crostini or pita wedges. You can lighten up the calories by using reduced fat cream cheese and reduced fat sour cream, but don’t go for the fat-free. The texture will be way off and you probably won’t enjoy it. Place the cream cheese in a medium bowl; beat with a mixer until completely smooth (1-2 minutes). Add the sour cream and beat for 1 more minute until thoroughly combined with the cream cheese. 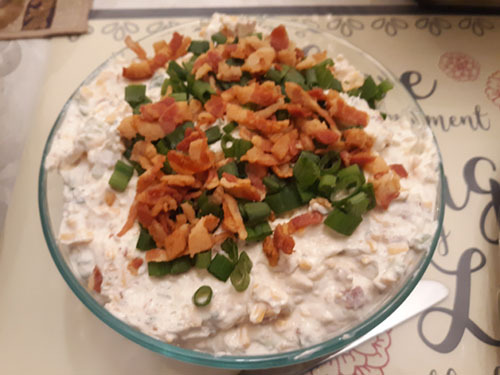 Stir in the cheese, ranch mix, bacon and green onions until well combined. Serve chilled, topped with additional bacon and green onions if desired.